Renowned painter Salavador Dali created just a few of the cards found in the Dal� Tarot Universal which features collage-type paintings, made up of what looks like clip art coated with copious amounts of gold ink. Planetary and Zodiacal associations are somewhat different from those found on many modern decks. For instance, The Empress is Earth, Temperance is Aquarius, and The World is Taurus. 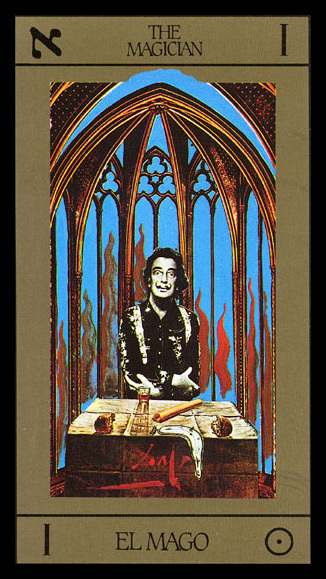 Dali is portrayed as The Magician card (El Mago) and he immediately confronts the Reader with his amazed countenance over a work table that holds a broken loaf of bread, a glass of half-consumed wine, a roll of parchment, and a clock face melting off the table away from the artist. You probably will not find many more trademarks of Salvador Dali's early surrealist years. Instead, expect a collaged world of clipped, classical Western art and Dali doodles which mimic and mock the very art upon which they are superimposed.